Paccar has developed it’s own transmission for use in trucks of Kenworth and Peterbilt. Paccar did not entirely build it’s own transmission, they left this to Eaton. Together with this company, Paccar developed an automated transmission from the ground up, which should be the lightest in it’s class and which is meant to be the final piece needed to offer customers an entire Paccar driveline. The new transmission is an automated twelve speed countershaft box meant to fit the MX engines of Paccar, which are developed by DAF, perfectly. Already from October, the new transmission will be available for both American truck makes. The new transmission does not come to other continents, it is specicially desgined for the US market. 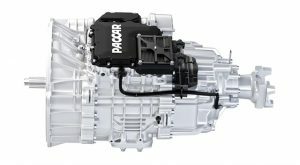 Paccars’ non American truck make, DAF, introduced it’s trucks recently with a new ZF transmission. A spokesman of DAF confirmed to Iepieleaks that the new transmission is destined for the US only.